Rich with spiced fruit caramel, yet also zesty and refreshing. 1. Put the citrus slices in an ice-cream tub and fill with water just off the boil. Cool, then freeze overnight. 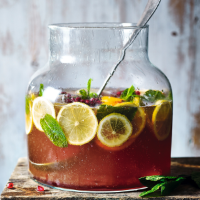 To assemble, put the block in a punch bowl (you may have to crush it slightly for it to fit) and add the rum, tea, lemon and pomegranate caramel. 2. Stir, then top with pressé. Serve in ice-filled teacups, garnished with mint and a wheel of lemon. 1. Mix 100g golden caster sugar with a splash of water and heat gently with 1 stick of cinnamon, 1 clove, 1 tsp of black peppercorns and 1 cardamom pod. 2. As it begins to caramelise, squeeze in the juice of two fresh pomegranates using a hand press (carefull - it'll spit!). 3. Stir to dissolve, remove from the heat and strain. Keep some aside to serve booze-free, minus the rum.